The restaurant features a brewery, bar, and indoor and outdoor seating areas. We're partial to the patio for dining at Disney's Boardwalk so guests can soak up the feeling of the fun seaside atmosphere will drinking up some great beers. Groups are always welcome here too, which makes it a great place to gather your friends and family for late night bite before heading over toe Jellyrolls or the Atlantic Dance Hall. Big River prides itself on serving each guest the freshest beer possible and has won numerous awards. The magic happens right there "on stage" with brew kettles on full view of the dining room and a brew-master on site. 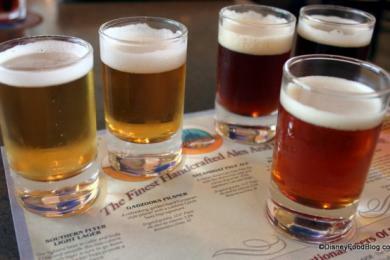 For those looking for some adventure they offer a beer flight that highlights off of their fresh brews. You can view the current beer menu at the link here. For non-beer drinkers there is also an extensive list of cocktails being serves up at the bar, and a "home-made" root beer that's fun for young & old alike. Big River also serves up a full dining menu of comfortable foods using fresh seasonal ingredients. 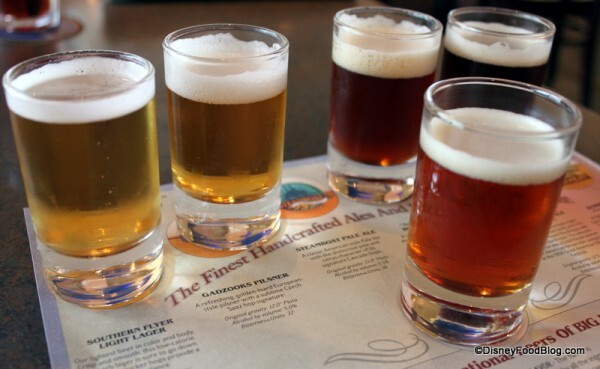 Have you stopped by the Big River Grille & Brewing Works? Leave a comment below and let us know what you thought! You can also read a full review of the Big River Grille & Brewing Works over at the Disney Food Blog. Cheers! Yes, one of our favorite places to stay when we head to Florida is the Boardwalk Resort and Big River Brewery is one of our favorite places to hang out in the afternoon sitting at an outside table on the Boardwalk, sipping a great beer and having something off the menu. Our two yearly trips from Illinois to WDW is during the Epcot Food & Wine Festival in the Fall and the Epcot Flower & Garden show in the Spring. We like to go at times when the crowds are down. There is nothing like taking a break from the crowds at the parks to go back to the Boardwalk and sit in the shade at BRB with a beer and a snack and watch people walking along the boardwalk at the Boardwalk Resort. Our home resort is not the Boardwalk, but we try to get into the Boardwalk whenever we can. If we can't get a room, it is still only a 5 minute walk from Epcot and what better way to take a break than walk over and get a table and rest for a while. The Boardwalk + Big River Brewery are favorite places for us to hang out. Forgot to mention that on ocassion, there is a little squirrel the locals have named "nutty the squirrel" that visits the outside eating area and he has no problem begging for food. We were there once and the table next to us gave him a scrap of food, and he went right up, took the food out of his hand and then sat on a chair on his hind legs and ate it. He looked at us and you could see him thinking, "What are you humans looking at?" I hope I'm not letting the cat out of the bag, but we're APers and this is our go-to spot to watch college football games (meanwhile, there's a line out the door down the boardwalk at ESPN Club). Sure, the game sound might not be loud, and the t.v's aren't massive, but there's great beer, good service, and a very relaxed atmosphere. That, and my Gators seem to lose every game I've ever watched at ESPN Club. Their keg tapping events are fun too!